These affected cases are being exported out of Turkey, so the recessive gene is spreading. I have not heard if we have affected ASDs or Kangal Dogs in the USA. The most recent case, 2006, is in Germany and one prior to that, 2004, is in Finland and the first case I read about was reported in Turkey in 2003. So it is coming if it hasn't already arrived. Note from the ages of the affected dogs, that the trait is apparently well established in related breedings since the affected pups obviously did not all come from the same mother. Possibly from sisters owned by the same person. Since the trait is probably recessive, this means that the sire also supplied genes to cause expression of the trait. Many Turkish dog importers have brought dogs to the USA over the recent years. Because the trait behaves as a recessive and apparently has modifiers as to degree of expression, it can be hidden until the gene in one dog meets up with another dog carrying the same gene and they each donate the recessive to the pups in their litters. We do have enough increase in COI numbers in the USA going by some of my calculations (with well over a thousand Turkish dog pedigrees in my database), that such recessives will turn up soon if we have them. Puppy buyers are brutally honest when breeders are hush. We need to know if this is happening in the USA and which bloodlines to avoid. Puppy buyers must continue to be honest where breeders have not. It takes a community to protect our breed. Here are the cases from the earliest reports to the present one. First reported case that I know of was in Turkey, published in Journal of the American Veterinary Medical Association in Nov 2003. The article from the Journal was sent to me by sharp-eyed Audrey at Shaman's Anatolians. Two 8-month-old and one 7.5-month-old Anatolian Shepherd dogs were examined because of excessive drooling and poor weight gain. The 2 older dogs were full brothers, and the younger dog was their half sister; all 3 had the same sire. Physical examination revealed that the dogs were unable to protrude their tongues properly. In all 3, the tip of the tongue was notched and deviated ventrally when the dog attempted to protrude the tongue. In addition, a thin tissue band between the sublingual surface of the tongue and the floor of the oral cavity was seen; this tissue band extended from the lingual frenulum to the gingiva of the mandibular incisors. Frenuloplasty was performed to correct the complete ventral ankyloglossia. Immediately after surgery, the tongue was more mobile, and during recheck examinations, the dogs appeared to be able to use their tongues normally and could protrude their tongues when panting. They had gained weight and weighed almost as much as their healthy siblings. In all 3 dogs, the tip of the tongue retained a "W" shape. WHERE did the German puppy that needed surgery come from? Who bred the dog? How related were the parents? WHO were the parent dogs? Were others in the genetic trail affected by the trait? Are there owners in Germany being tightlipped about it? An affected puppy and its unaffected littermate turned up in Finland in 2003. As far as I know, the affected one wasn't serious enough to need surgery. The dogs seemed a bit small but I don't have an update on them. Sadly... my friends, this IS the way Ankyloglossia is going to spread in the Turkish dogs all over the world and it is happening NOW. . . This is a case published in Aug 2006 in a German Vet periodical. Kleintierpraxis Reinle und Grundmann, Well am Rhein, Deutschland. 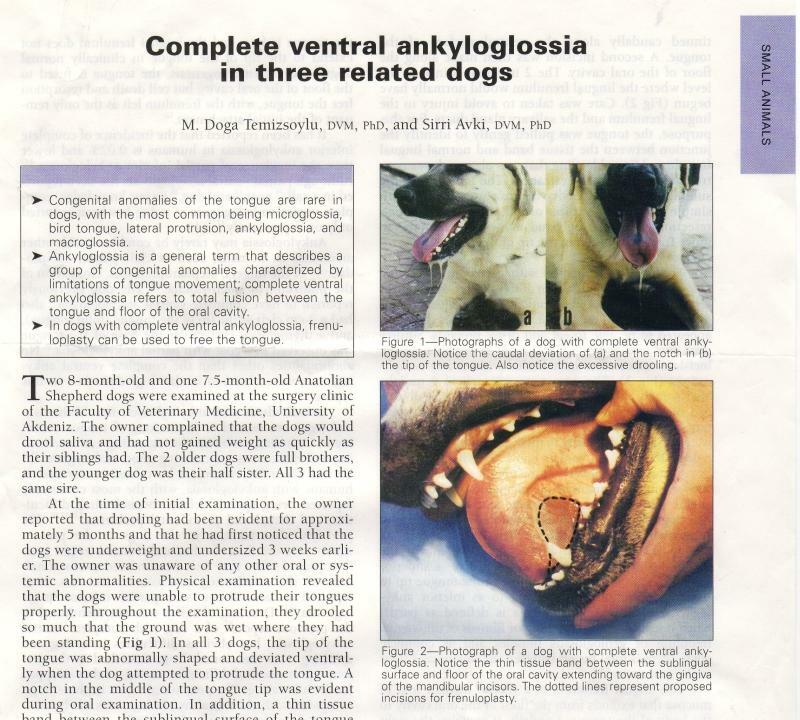 Ankyloglossia, commonknown as tongue-tie, is a rare congenital oral anomaly in dogs. A complete attachment of the lingual frenulum to the floor of the oral cavity leads to limited mobility of the tongue including problems during eating and swallowing. In humans ankyloglossia is a common anomaly in newborn infants. In our report a 5-month old Anatolian Shepherd dog was surgically treated and full function of the tongue could be achieved with a horizontal-to-vertical frenuloplasty. Thank you very much for you very informative and interesting post. It's giving a complete over view about Ankyloglossia. Whoa! That's an eye-opener. Thanks for the information.